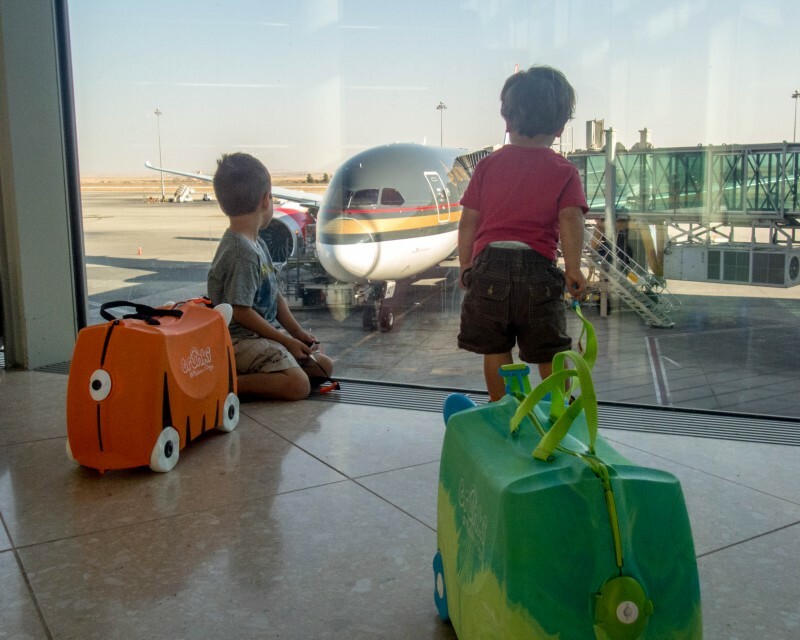 Our Royal Jordanian flight had set down after a gruelling 11.5 hour journey and I was secretly hoping for two things; that our luggage had made it; and that we had just made it through what would be the hardest part of our trip! From the moment we had stepped in the Toronto airport for our trip to Jordan, things had gone less than smoothly. It had taken nearly an hour to get our tickets at the American Airlines desk as, even though we had booked our own seats, they ignored that request and placed us in an emergency row, which is not allowed if you have a lap infant. With minutes to spare we arrived at our gate with two tired and hungry children and got settled for our quick hop to Chicago. After stopping in Chicago we went through security and proceeded to the Royal Jordanian counter to check-in for our flight to Amman. The Royal Jordanian attendant informed us that our luggage could not be located, but he would make it his personal mission to locate it time for our flight. True to his word, right as we prepared to board the plane he came running to the door to let us know that our luggage had been found and loaded on to the flight! Exhausted, we settled into our seats and Kevin and I prayed to the sleep gods that the kids would go to bed as it was approaching midnight. C settled right in after he found a fifth pillow to add to this seat fort and he was off to dreamland. 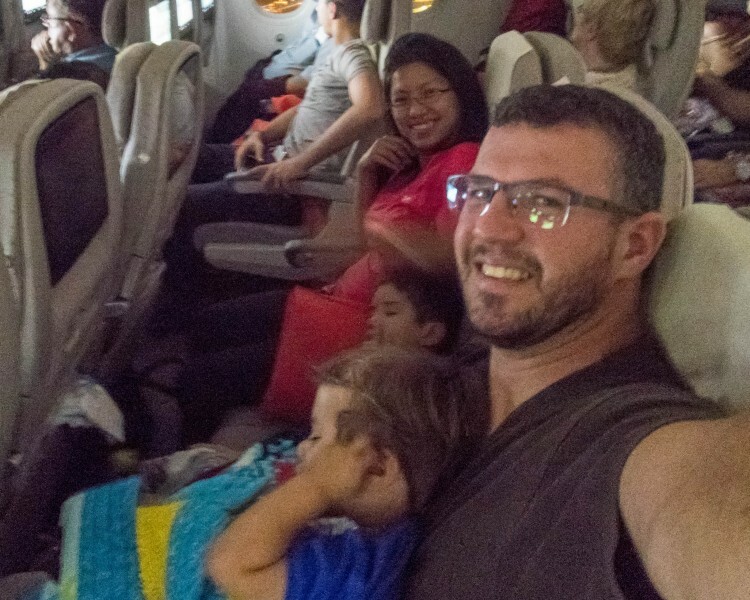 D, however, had only met 50% of the plane’s passengers so off we went for the 10th journey through the aisles to say hi to the passengers he hadn’t yet met. Finally, at 2am he had dozed off and Kevin and I thankfully did the same. At the Queen Alia International Airport we were met by Fadi, a Jordan Select representative who helped us with our bags, and spoke to immigration on our behalf so we were able to get our visas with no hassles or lines. He also went over our tour details to ensure all our questions had been answered. We were guided up to the parking area where he introduced us to our driver for the week, Qais Bader. Qais instantly connected with the kids and even though they were tired, he had them laughing and joking immediately. The airport was only 25 miles from our hotel in downtown Amman, so before we knew it we had arrived at the Toledo Hotel. After enjoying a delicious buffet dinner we settled in for the night. 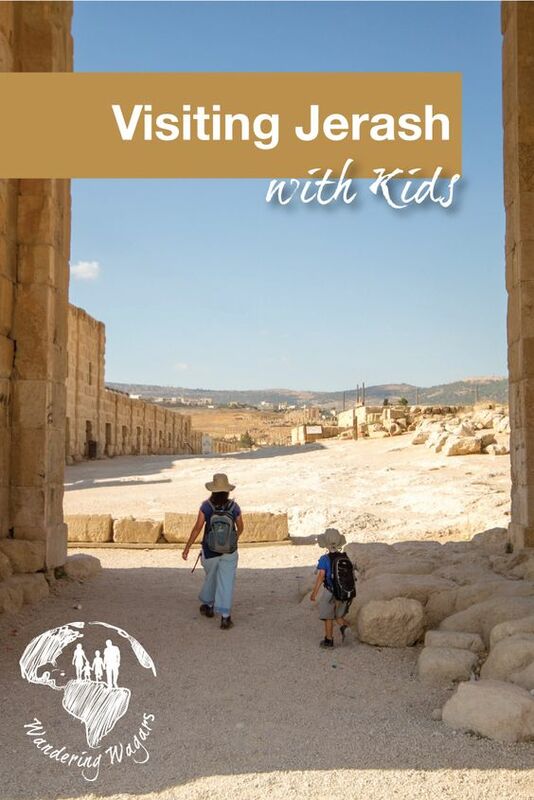 Tomorrow we would be heading to Northwest Jordan for our first day of sight seeing. The children willingly fought jetlag with the promise of exploring castles and ruins. 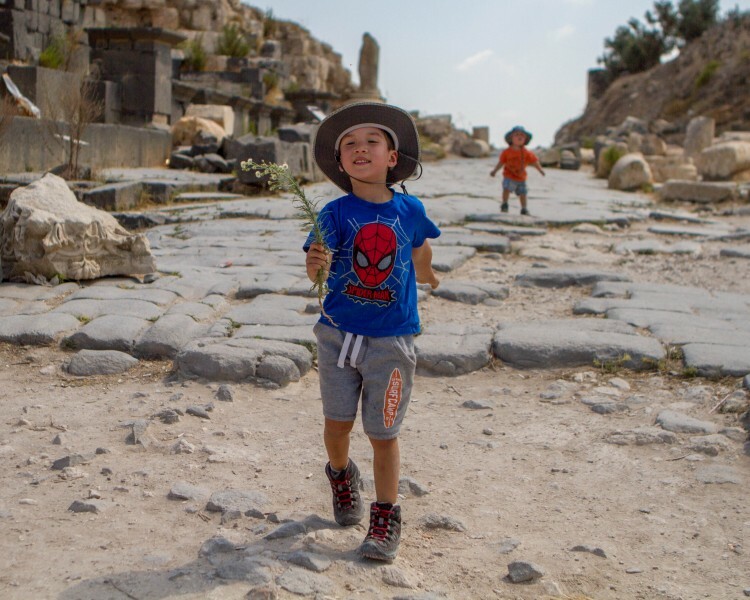 First stop on our tour, was the ancient town of Umm Qais, one of the decapolis cities also known as Gadara during biblical times. The children ran ahead picking up pieces of black basalt and checking out the shops that once lined the street. Next, we explored a partially restored amphitheatre. The West Theatre is one of three theatres in the city and the most intact. C tested out the acoustics by performing a moving rendition of “Twinkle Twinkle”. Further along we reached the main road passing through the site, Decumanus Maximus. Following the stone road to the right leads you to the steps up to the Basilica terrace. Next to the terrace are ruins of the octagonal interior sanctum of the church. On one of the columns, a carving of a cross is still obvious. To the left is an amazing viewpoint where you can see Syria, Israel and Palestine. Until the 70s, locals were living in the abandoned structures on the site. Modern day additions included thatched roofs and wall paintings. However, in 1974 locals were asked to leave the site and were relocated by the government in housing complexes in the nearby town. 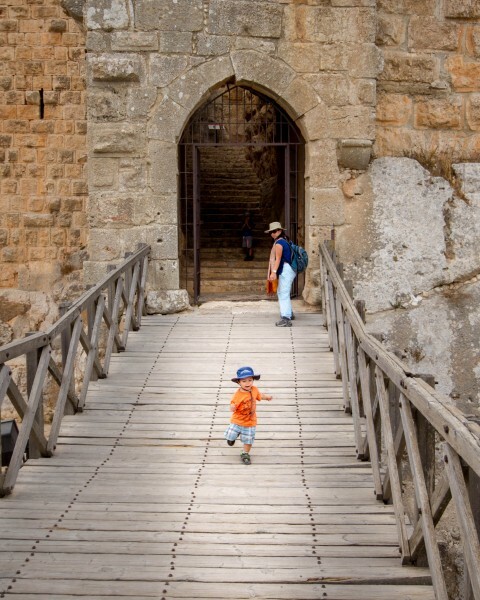 Our next stop was the picturesque Ajloun castle (Qala’at Ar-Rabadand) in the town of the same name. 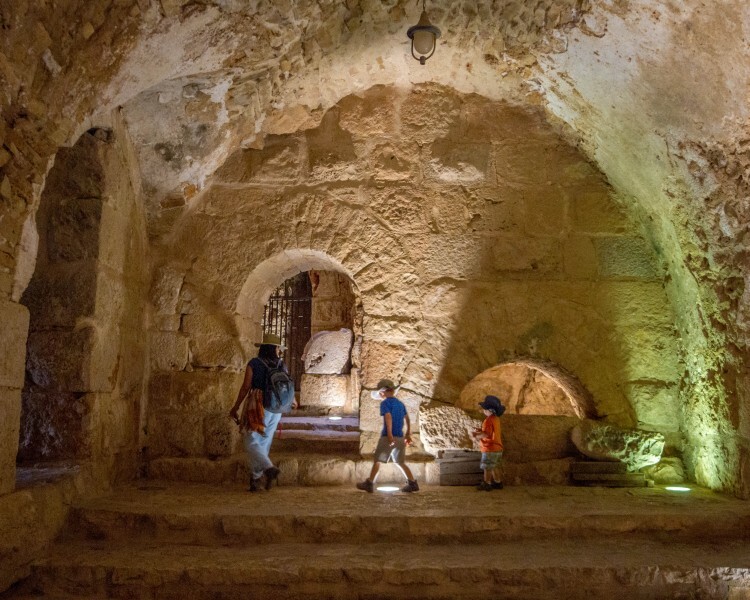 The smallest of the crusader castles in Jordan, it was built between 1184-1188. 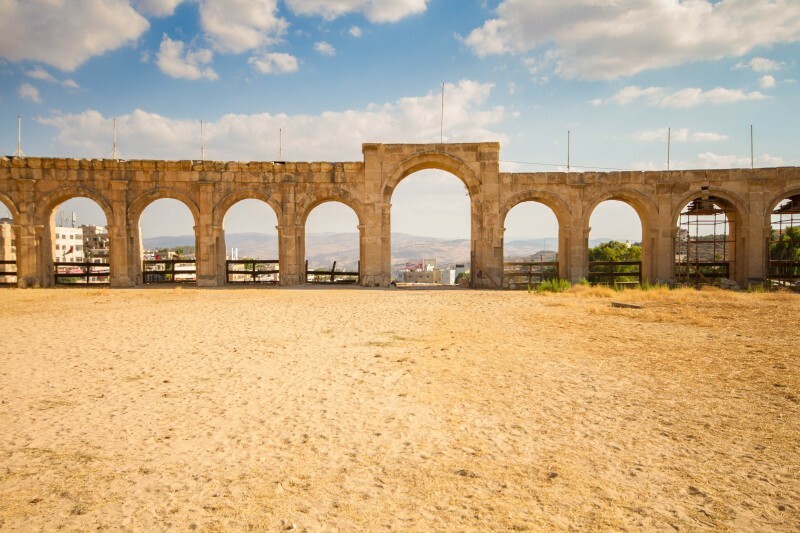 From the top of the castle one has sweeping views of the Jordan Valley and three Wadis. The castle once had 7 towers and a 15m deep dry moat. The interior is well lit making exploration very easy. With a ruin and a castle under our belts, it was time to have a break for lunch. We were greeted with freshly made naan bread from the Artemis restaurant’s outdoor oven. They also had a nice playground for the kids to enjoy while we savored our delicious lunch. The restaurant provided an amazing view of our next stop, the ruins of Jerash. 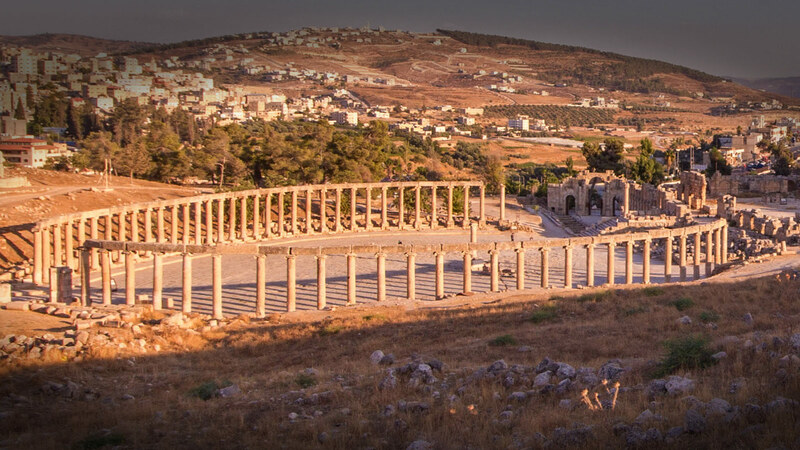 Jerash is said to be the largest roman ruin outside of Rome. We started exploring by passing through Hadrian’s Arch. 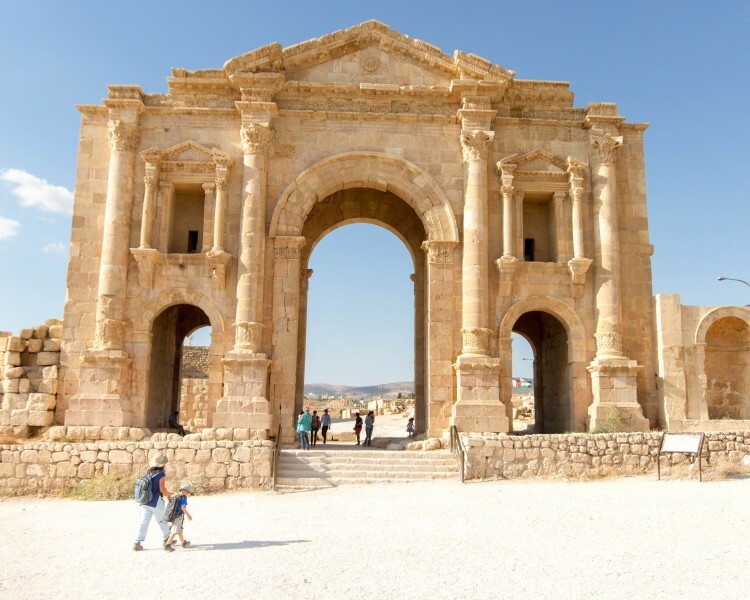 The 13m tall arch was built to celebrate the visit of the Roman Emperor Hadrian to Jerash in AD 129-130. A few meters from the Arch and we saw the entrance to the Hippodrome. Unfortunately, due to the decrease in tourism numbers, they were not conducting any chariot races. But looking around the grand stadium it is easy to imagine 15,000 spectators cheering for their favourite athletes. Approximately 200m from the Hippodrome we reached the South Gate, one of the four entrances into the walled city, where we met our tour guide. As we passed through the gate we were in awe at the 56 Ionic columns that formed an oval in front of us. From the Forum we could see the Temple of Zeus, the walls of the South Theatre and the main street, Cardo Maximus. Walking along the entire 800m length of the Cardo Maximus affords some great sites of ruins in various states of restoration such as the Nymphaneum, Cathedral, Northern and Southern Tetrapylons, an agora and the Western Baths. Instead of walking the entire length, we decided to save our energy for the ascent via the Propylaeum to the Temple of Artemis. After taking a break and enjoying the view from the Temple, it was a downhill walk straight to the South Theatre. Built between AD 81 and 96 the South Theatre once housed 5000 spectators. 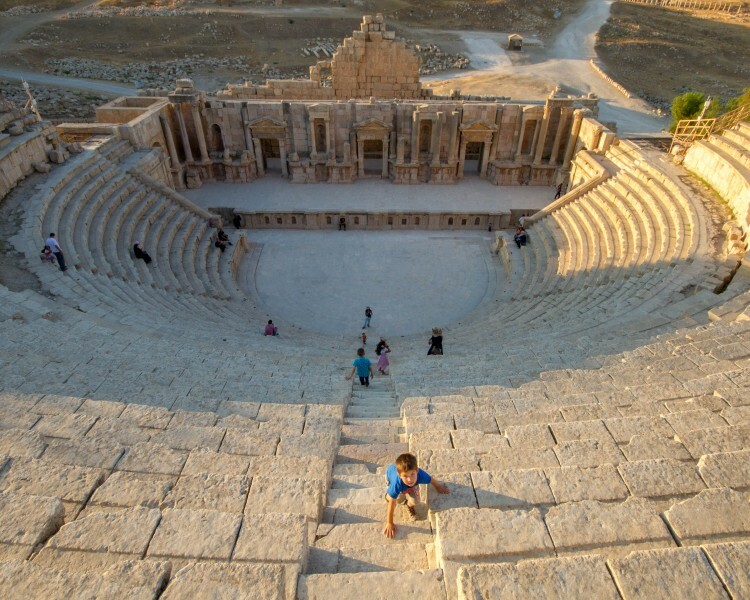 The stage is elaborately decorated and the theatre is sill used for the annual Jerash Festival of Culture and Arts. And with that, we finished our first full day of touring in Jordan. Just outside the entrance of the Jerash ruins is a restaurant. The children behaved so well, they got to enjoy a pre-dinner ice cream on the drive back to our hotel in Amman to rest before tackling the King’s Highway. The castle looks prolific! Did you go down to temple of zeus? Amazing photos Christina! Felt like I was touring Jordan too while I was looking at them. Being a fan of history, I too would also love to go to Jordan. Someday. 🙂 Great guide! I am always so impressed to see historic monuments and sites. The sheer size of them and how they were built without modern equipment is so fascinating. Sorry to hear about all the stress of your flight there, though it sounds like your first day of actually exploring turned out to be wonderful. Glad that the kids had such a fabulous time too – really wonderful way to get them interested in history and culture. 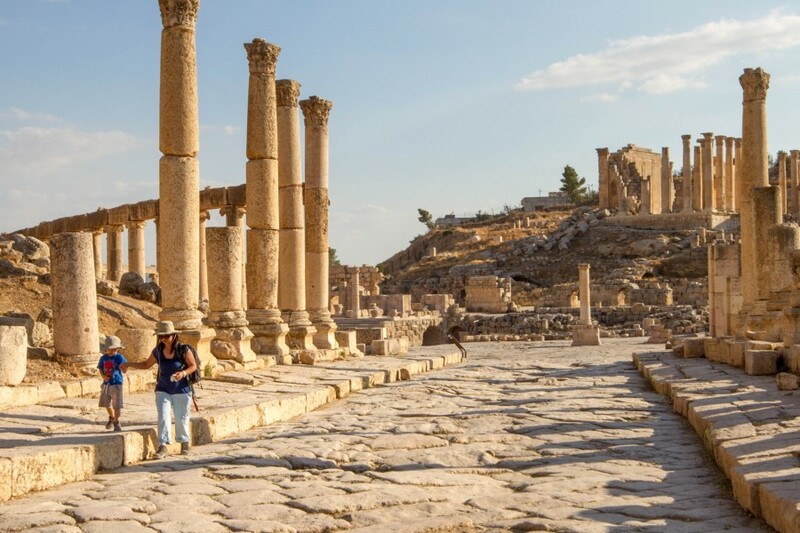 I would love to get to Jordan – Amman is on my list! Your photos look incredible! The viewpoint into Syria, Palestine, and Israel and the views of the Jordan valley are stunning. I’d love to visit and learn more about the history of the ruins and the castle. 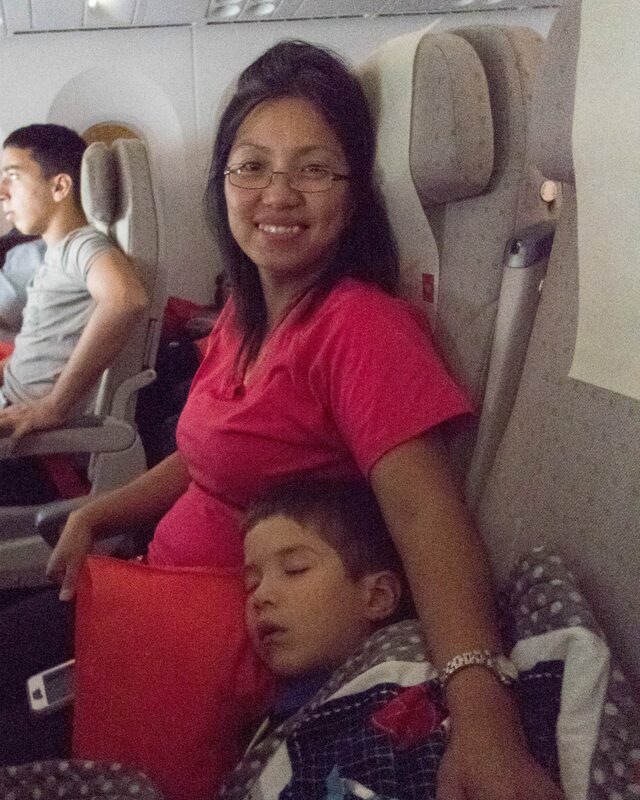 Especially love your commitment to traveling with your children. Firsthand experiences are the ultimate way to learn and inspire curiosity. This is a BEAUTIFUL blog post – loved the photos and the stories! I am so impressed by the airline staffer who went so far out of his way to take care of the bags and to let you know so you would worry less – that is really amazing service. Thanks Vanessa! 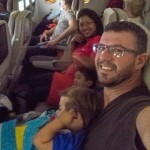 Yes the Air Jordanian people were really fantastic! Thanks for dropping in! Sounds like a adventure on the flights. At least you got your bags. I once arrived in Iceland in February with only my light weight plane jacket. The airline lost the bag somewhere between Equatorial Guinea, Spain, Netherlands, and Iceland. I was not a happy camper. Those ruins look amazing. I bet your boys loved exploring those ruins. Ouch, Iceland in February is probably not the place you want to be without some warm clothes!